Most commentators on Philemon work with the dominant understanding of the relationship of Philemon to Onesimus. They are master and slave. In some way Onesimus has brought harm to Philemon and has fled. He has somehow found Paul, whom he has known to be a close friend of his master Philemon. The extant letter is an appeal to Onesimus’s master to receive him back—to “accept him” in the same way that Philemon would welcome Paul (v. 17). Paul informs Philemon that Onesimus has become a Christian disciple while with Paul and he reminds Philemon that he owes to Paul his very self, as well, presumably a reference to the fact that Philemon also has become a Christian convert through Paul’s ministry. It appears that Onesimus is not incarcerated, for Paul the prisoner is able to send him back to Philemon along with his letter. Not much else can be known about the situation lying behind our canonical letter, though variations of this consensus interpretation appear in commentaries and monographs. Most commentaries also make reference to a minority interpretation of the relationship between Philemon and Onesimus. Allen Dwight Callahan, in several articles and a monograph, has argued that they are not master and slave but actual brothers. Callahan claims that the interpretive tradition of a master-slave relationship began in the late 4th century on the basis of the tentative speculation of John Chrysostom. Though Callahan’s reconstruction can be found among interpreters seeking abolition of the slave trade in the 19th century, there are almost no current interpreters that share Callahan’s minority view. For perhaps for this reason he was separated from you for a time, that you might receive him back forever, no longer as a slave but more than a slave, a beloved brother, especially (“certainly, exceedingly”) to me, but how much more to you, both in the flesh and in the Lord. Paul plainly indicates that they are brothers, “not only in the flesh but also in the Lord.” Commentators, however, have found various ways of accommodating Paul’s language to the interpretive consensus. For some, that Paul notes that the two are “brothers in the flesh” may mean that they are members of the same household. Even if Philemon is the master and Onesimus the slave, their being of the same household means they have some level of solidarity. Another way that commentators handle Paul’s words here is to view them as an exhortation. Paul is urging Philemon on the basis of his new relationship to Onesimus, to love and embrace Onesimus as a brother “both in the flesh and in the Lord.” The solidarity enjoyed by all those in Christ trumps all other loyalties, so Philemon must now embrace Onesimus fully as a brother. That is, because they are brothers in the Lord, they must embrace and function as brothers in the flesh. does not mean that Onesimus was a brother of Philemon ‘in the consanguinary sense’ or as a ‘blood relative.’ It is merely Paul’s way of stressing Onesimus’ condition as a human being in contrast to his condition as a Christian. Sarx denotes, as often in Paul, that aspect of human life that is bound by earth-oriented interests, limited in its capacities, and affected by its appetites, ambitions, and proneness to sin. As used of Onesimus, the phrase en sarki expresses his basic human status apart from his condition as a slave; it is a status that Onesimus shares with Paul and Philemon, and Paul acknowledges that aspect of Onesimus’ existence (p. 116). 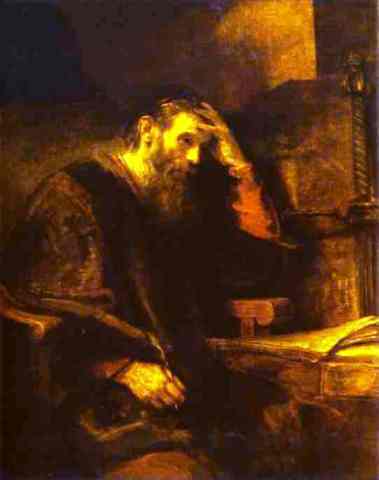 In this series of posts, I hope to demonstrate that those who take the consensus view of the relationship between Philemon and Onesimus have not reckoned adequately with Paul’s language in vv. 15-16. Whether or not such a reconsideration of this passage leads to a reconfiguration of the imagined situation involving Paul, Philemon, and Onesimus, commentators on this epistle must take Paul’s language especially in v. 16 more seriously. I think it is extremely unlikely that Paul’s words can be interpreted to mean that Philemon and Onesimus are both human beings or that they share the same social status. I’ll elaborate some considerations in support of this in the next several posts. If you haven’t already done so you might enjoy checking our David Pao’s reading of Philemon (ZECNT). He would be another minority view and probably the correct one. Cheers, Ben–I’ll check it out. Stimulating stuff Tim, especially when you consider how much more difficult it can be for siblings to accept each other in the Lord when they have a fractured relationship. I look forward to reading more. Treatment of ‘Adelphon en sarki’ as being members of the same household is weak given how strongly Paul uses σάρξ elsewhere in his writtings. Even treating it as meaning ‘of a common humanity’ is still pretty weak compared to see seeing its meaning ‘being born of a common ancestor’, or ‘born of a natural generation’. Joseph Fitzmyer’s exegesis contains the least fidelity to the original language and appears primarily intended not to convey the sense of the Greek but a theological point – which is lamentable. So you have a great basis for making the case the original language hasn’t been adequately been dealt with. However, I do not wish to point out something further about ‘brothers of the flesh” (I’ve done that elsewhere), but wanted to direct your attention to Paul’s Greek in [II Cor 3:17] to propose that Paul uses ‘in the Lord”‘ (ἐν Κυρίῳ) and ‘“in the Spirit”‘ (πνεῦμα) interchangeably; so there really is a nice parallelism between what Paul is saying here and elsewhere (such as 2 Cor).